On this chilly dreary day, let us think of something warm and sunny. 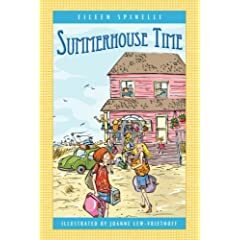 How about Summerhouse Time by Eileen Spinelli? After I read Where I Live by Spinelli, I thought I should try Summerhouse Time. It sounded, from reviews I read, to be the same type of book. It was. Written as a mix of poetry and prose, the story follows the main character, Sophie, and her family on their annual visit to the summerhouse they share with other members of their family. Although the visit is usually the family's favorite part of the summer, there are many things that have changed this year. Even though it is not the same great time they usually have, all works out in the end and Sophie ends up having a wonderful time. I love how the book is really just short poems put together as chapters. It makes the read go so fast. At first I thought it was just different poems about summer and I was a little bummed. But I should have known better.